As many as 260 units could be proposed for the MN AIDS site. That parcel and the one to the west are owned by MN AIDS project, totaling 1.7 acres. Then there's the awkward "pocket park" or whatever of public land adjacent to the north. They could propose to do something really cool on that public land in exchange for paying the park fee. Based on the unit count, location, and sheer amount of land available, my best guess is a supersized 6-story stick frame project. Yes it is a very large area. I'm more of one that will say that things will be done in phases instead of one huge build out. 260 units divided over nearly 2 acres would be very low density for what I'm sure the city is hoping to get from this area that is so close to the core. The land is worth a lot of money, so I'm sure density will be a factor in what they build to fill the area. MAP may stay and lease back their current building if they can once they sell the land. Would cost them a lot of change to relocate the nonprofit. At this point it would make more sense to do a year to year lease and look for option for a move with a bit more time and see what else is available for them to move to. They would stay until a later phase of the development comes along and they need to tear down the building. This way the developer has cash flow coming in from the MAP lease to help cover payments until a few phases are completed to take care of the cash flow for the property. All the land, but the MAP building, is cleared and ready to build on so no need to tear it down right away. They can develop around it until they need it. This is only the Wedgeucator's personal opinion and not that of MAP or the developers. Just to clarify, the area in the blue box is only part of that the developer is buying. From the talk I had with one of the people who works at MAP. The two orange boxes west of MAP are also theirs. Unless the developers only buying a section of the land that is for sale then there should be enough room to build close to 5-6 building/towers and still have some green space in-between the towers for residents. Also because I can't see any of the real details of the article, I'm trying to imagine what type of housing they plan to build here. With Central College east of Chicago there maybe a market for some student housing being 2 blocks away. Where this is located near subsidized housing, they could cash in on some affordable housing grants for a portion of the apartments. This area is so large you could put a whole different range of housing product up there and have choices for a whole income range of people. It is not that far from Skyscape so market rate could well be an option for the area fronting 14th street. Every possible answer just bring new questions to my head. So until I can read the article I'll just say that the 260 units is one section of the developable land and there are other sections or phases that a different builder/s they will partner with for those. I hope that I made that understandable. It is only went you stand in the vast open area can you imagine the vast number of units that could fit into the space. Edit: The blue box on the Hennepin map is only .77 acres, so the site to the west is the other acre. You could easily build 2 building on the .77 acre area alone. with each of the buildings having 260 unit minimum and still have green space. I.77 acres is a lot of land to fill and a lot of dough to raise at once. I know they are asking for top dollar while the market is strong for the land. That is why they decided to sell off and possibly may have to move now. I think that MAP bought while the area was in decline and got a very cheap rate for the price of the land. Who ever sold it must be kicking themselves right now!! Confirmed: stick construction, six stories, two levels of underground parking. Will use entire 1.7 acre site and have "significant" amenities & outdoor space. "Straight market rate" finishes and rents to be a step below recent downtown projects. Catered toward HCMC & gov't employees, others who want to live close, but not in the center of downtown. I guess it's more tax base in Elliot park. Lets hope it looks decent though. With only 260 units and 1.7 acres, this sound like a 222 Hennepin wanna Be. Sorry if I don't have a good feeling about this project. Missing an opportunity for density here?? Saving grace, if any, is it fills vacant land and increases the tax base here in the city. I was hoping for at least 10 stories and room for green space and smaller retail. I guess both could still happen? grant1simons2 wrote: I was hoping for at least 10 stories and room for green space and smaller retail. I guess both could still happen? Not if as TC says they are using the whole 1.7 acres for the 260 units. Still find those numbers disturbing!! Not sure what you mean. Density on this parcel would be slightly greater than recent Uptown projects like Elan, Flux, etc. Denser than 222 Hennepin too since it doesn't have the huge commercial space. 222 Hennepin has 286 units on a parcel nearly 50% larger than this. This proposal is really quite dense. This site is blocks away from any other current or proposed development. The HCMC expansion, Portland Tower condos, Kraus Anderson HQ, etc. are all a few blocks away. For lack of a better/PC expression, this site basically has one foot in DTE and the other foot in the ghetto. This development will represent the only real investment happening in Elliot Park since the mid-00s condo boom produced Grant Park Homes & Skyscape. Best case is that this development spurs other developers to look at nearby sites, like the Ziebart / Assemblies of God block across 14th. I am curious what, if anything, they'll propose to do with the publicly-owned triangle of land on the north side of the site. It's technically public ROW, created from a vacated 14th Street, and not actually a park or anything formal. As long as they build a fabulous green space on the north side where the 14th and Grant St. come together (via sidewalks) maybe a fountain, a few benches and a min/pocket park it could be a fantastic addition to the community. I would argue about the height as well but we all know the community wanted portland tower shortened. 6 floors is decent enough. Plus underground parking will be fantastic! Maybe the city will try to squeeze a small 1K-2K ft. of retail space? Would greatly enhance the local community. Huh, almost all of the buildings lost to parking lots in this neighborhood were homes. And just about everything that's left is historically protected, which leaves Elliot Park poised to have the best long-term outcome for development as far as density is concerned. 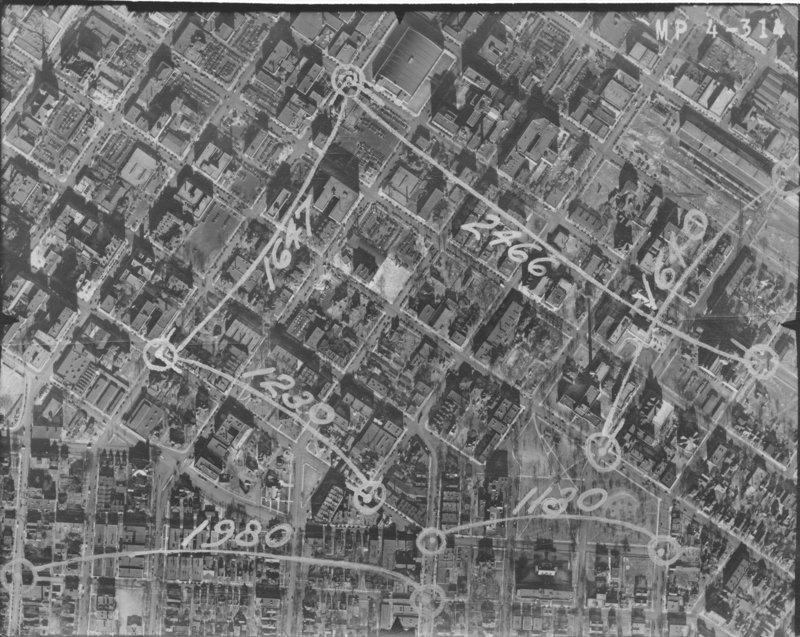 I was just poking around looking at historic aerials & birds eye drawings of downtown yesterday, and it's pretty crazy how many structures had already been torn down for surface parking by the late 30s. Really curious to see how this project looks & interacts with the sidewalk. It would be nice if they built a new alley running between 14th & 15th on the west side of the lot as the only entrance points for the building. That would leave each face open for nice entrances or patios at the ground level. After reading that the 2700 University is the same size and nature, I'll finally believe that this is what will happen. I look for building surrounding a court yard in the middle. I would hope that the units that are street facing would be walk up units with small porches or decks similar to those used on many of the Greenway complexes. Was hoping for more density. But this will probably fit better into the context of the existing neighborhood, at 6 stories. I agree with some sort of mid block walkway between 14th and 15th to allow for walk ups on the west side and a short cut though a very long block. Didn't get a chance to mention it in my original story last week (http://finance-commerce.com/2015/06/wei ... liot-park/), but the developer did mention some walk-up units along the sidewalk. Keep an eye on that as plans move forward through the summer/fall. They're adding 614 & 622 E 15th St to the development site, increase in unit count (still 6 stories). 622 is a standard duplex and is a pretty sure bet to be demolished. 614 could potentially be declared historic. It currently looks really dilapidated, but if you go back in time on Street View, you can see what it looked like before they put up the plywood. Built in 1898. Cool unique structure but I would totally understand if it is too far gone. Would be awesome if they would incorporate it somehow, but I'm not holding my breath. Article also notes there will be a prominent lobby and coffee shop at the corner of Park & Grant. 614 is having some pretty severe roof sagging issues. I'll take a picture when I get back home. It's on the National Register, and it's an Individual Historic local landmark. Last edited by seanrichardryan on August 18th, 2015, 10:28 am, edited 1 time in total. 614 is on the National Register (the First Church of Christ - Scientist). That would be a real loss.